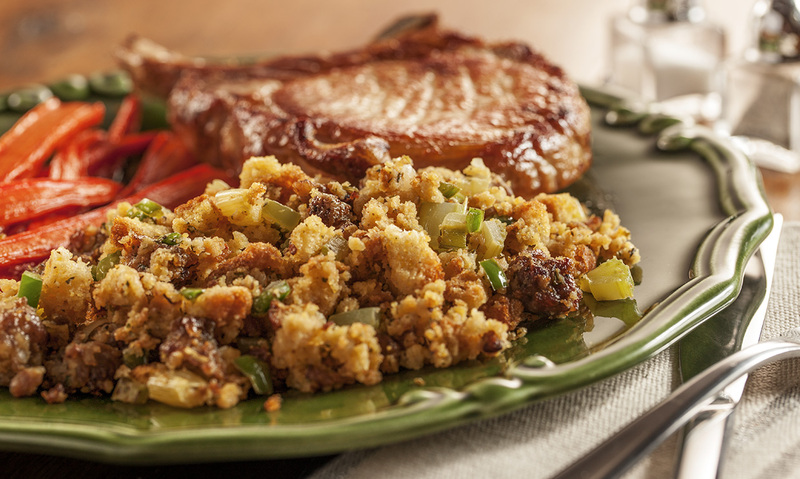 Try our zesty spin on traditional stuffing featuring our Sage Sausage with Italian seasoning and Jalapeño Peppers. Heat oil in a large skillet over medium heat until hot. Add onions, celery, and jalapenos and sauté until onions are translucent, about 3 minutes. Add Sausage, crumble with a potato masher and cook for 5 minutes until sausage browns and is fully cooked. Place stuffing mix into a Crock-Pot and combine with sausage/vegetable mixture, chicken broth, Italian seasoning and egg. Stir well to combine. Cover Crock-Pot and cook on low for 2 hours. Hold stuffing on warm setting after 2 hours until serving for up to an additional 6 hours. *Depending on how long you are holding the stuffing. Add chicken stock to stuffing as needed to the desired moistness and to avoid drying out. 1 Heat oil in a large skillet over medium heat until hot. Add onions, celery, and jalapenos and sauté until onions are translucent, about 3 minutes. 2 Add Sausage, crumble with a potato masher and cook for 5 minutes until sausage browns and is fully cooked. 3 Place stuffing mix into a Crock-Pot and combine with sausage/vegetable mixture, chicken broth, Italian seasoning and egg. Stir well to combine. 4 Cover Crock-Pot and cook on low for 2 hours. Hold stuffing on warm setting after 2 hours until serving for up to an additional 6 hours. 5 *Depending on how long you are holding the stuffing. Add chicken stock to stuffing as needed to the desired moistness and to avoid drying out.